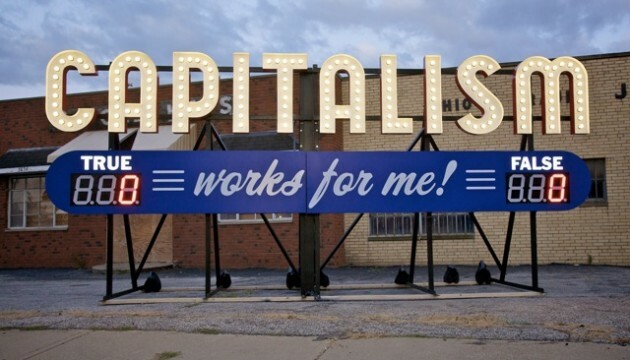 Steve Lambert, Capitalism Works for Me, 2011. Steve Lambert is an American artist who works in a variety of media, commonly using print and communication vehicles as a means of developing a dialogue with his audience. He has produced interactive scoreboards, letterpress posters, signage and postcards. One of Lambert’s best known projects is The New York Times “Special Edition”, which announced the end of the wars in Iraq and Afghanistan following the 2008 American election. He has collaborated with well-known art collectives such as the Yes Men and the Graffiti Research Lab, and other organizations such as Greenpeace. He is also the founder of the Center for Artistic Activism, the Anti-Advertising Agency, Add-Art (a Firefox add-on that replaces online advertising with art) and SelfControl (which blocks grownups from distracting websites so they can get work done).